Pen drive, flash drive or USB drive; whatever you call it, this tiny device is more than a gadget to carry tons of data safely. A pen drive is a vital device and is carried by most working professionals on a daily basis to store the essential data. If a pen drive is always with you, why not allow it to reflect your personality! If you have spent your childhood watching your favourite cartoon shows on TV, these pen drives will surely appeal to you. If you love superheroes, we have Captain America and Batman pen drives. Are you a Minions fan? There is a Minion themed pen drive as well. 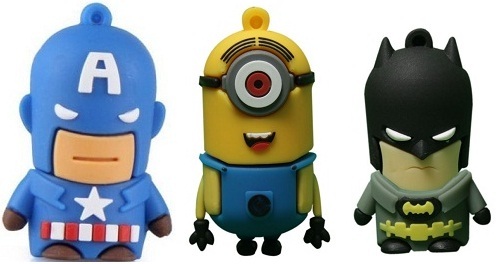 Take your pick from our collection of cartoon themed pen drives. Love to accessorize? Here are wristband shaped pen drives available in three different colours if you like to wear an accessory all the time. 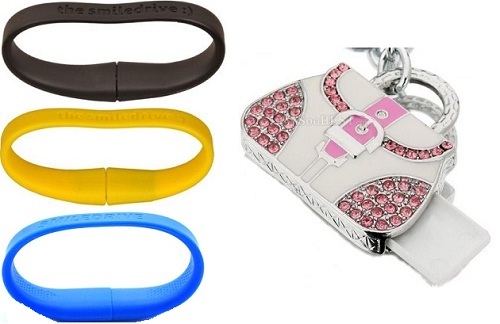 However, you can opt for the handbag shaped pen drive if you want to flaunt your love for stylish accessories. The wristband shaped pen drive looks stylish on your wrist and is super light – 19 grams. The best part about a wristband shaped pen drive is that you won’t forget it anywhere as you will have a habit of wearing it all the time. 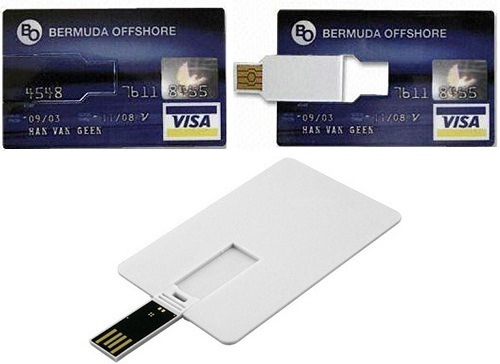 If you love the sight of multiple credit cards in your wallet, a credit card shaped pen drive is your best bet. You can buy multiple credit card shaped pen drives for personal and official use and fill your wallet with these credit cards. You can simply keep in your wallet or credit card holder without making it look bulky. If you love digging into your favourite bar of chocolate or ice-cream after every meal, these pen drives are just for you. Show your love for chocolates and desserts with these chocolate and ice-cream shaped pen drives. Besides a 9-5 job, we all are passionate about living in life. It could be love for cars, playing a musical instrument or clicking photographs. It is really important to try and devote some time towards fulfilling our passion in our daily lives. If you love cars, there is a car shaped pen drive. If you love playing guitar, this guitar shaped pen drive is a must have. There is a camera shaped pen drive for photography enthusiasts too. So, what’s your passion?